Selling a Tonka? 1953 Look Book Details - all Items for 1953 shown. Please be patient, lots of photos to load. 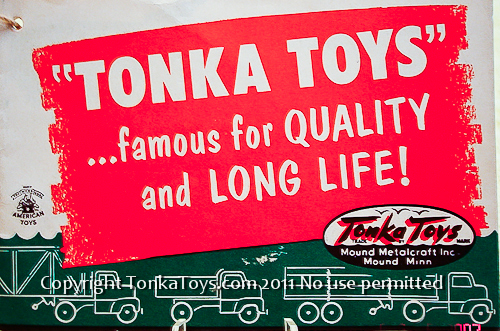 Interested in Selling a Private Label Tonka Truck or Set? click here. I am actively looking for sets like these sets shown below! 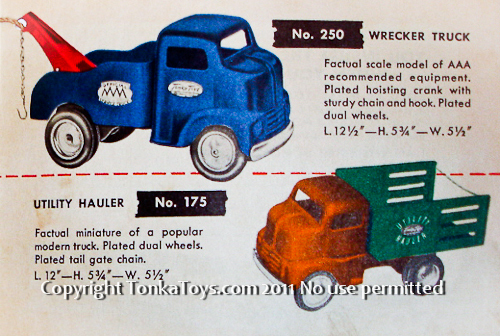 Tonka Toys Look Book from 1953 - some look books are hard to find but The 1953 Tonka look book is certainly the hardest. 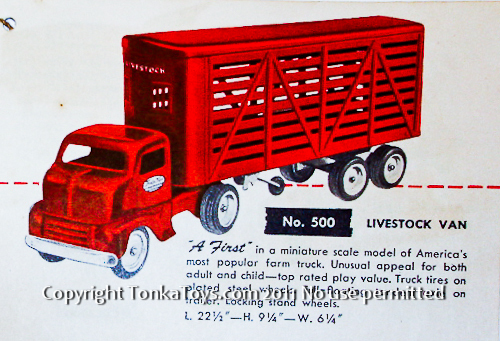 a first-in miniature scale model of America's most popular farm truck. Unusual appeal for both adult and child-top rated play value. Truck tires on plated steel wheels. Full-loading tandem axle on trailer. Locking stand wheels.22 1/2 inches long, 9 1/4 inches high, 6 1/4 inches wide. factual scale model. Heavy steel dual rear wheels. Rubber tires. 12 inches high, 6 1/2 inches wide, 5 1/2 inches tall. accurate scale model. 10 rubber tires. Both tractor and trailer have dual wheels. Retractable stand wheels. 22 inches long, five and three-quarter inches high, 5 3/4 inches wide. accurate, interesting scale model of modern industrial equipment. Slated loading winch and chain. 30 1/2 inches long, 12 1/4 inches high, 6 1/2 inches wide. 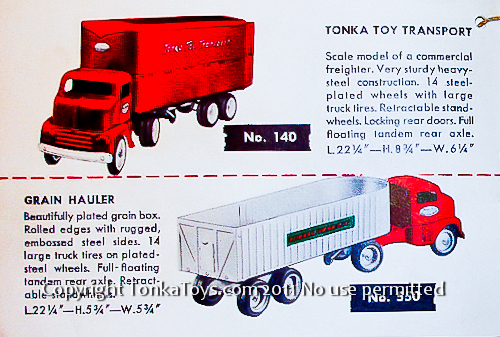 factual miniature heavy-duty logging truck. Large load of logs in plated log chains. Full floating tandem or axle on trailer.22 1/4 inches long,5 3/4 inches high, 5 3/4 inches wide. scale model of the commercial freighter. Very sturdy heavy steel construction. 14 steel plated wheels with large truck tires. Retractable stand wheels. Locking rear doors. Full floating tandem or axle. 22 1/4 inches long, eight in three-quarter inches high, 6 1/4 inches wide. beautifully plated grain box. Rolled edges with rugged embossed teal sides. 14 large truck tires on steel plated wheels. Full floating tandem rear axle. Retractable stand wheels.22 1/4 inches long, five and three-quarter inches high, five and three-quarter inches wide. factual scale model of AAA recommended equipment. Plated hoisting crank with sturdy chain and hook. Steel plated dual wheels. 12 and half inches long, five and three-quarter inches high, 5 1/2 inches wide. 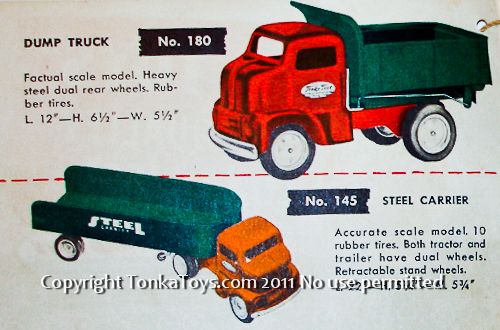 factual miniature of a popular modern truck. Plated dual wheels. Plated tailgate chain. 12 inches long, five and three-quarter inches high, 5 1/2 inches wide. 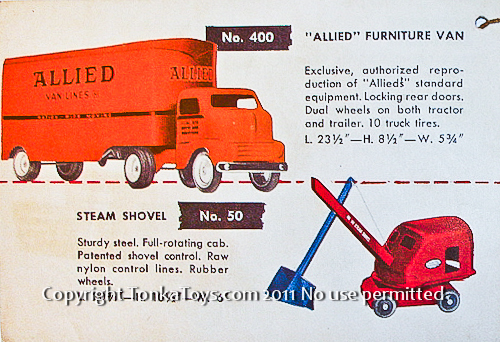 exclusive, authorized reproduction of Allied's standard equipment. Locking rear doors. Dual wheels on both tractor and trailer. Has 10 truck tires. 23 1/2 inches long, 8 1/2 inches high 5 3/4 inches wide. sturdy steel. Full floating. Patented shovel control. raw nylon control lines. Rubber wheels.20 and three-quarter inches long, and a half inches high, 6 inches wide. 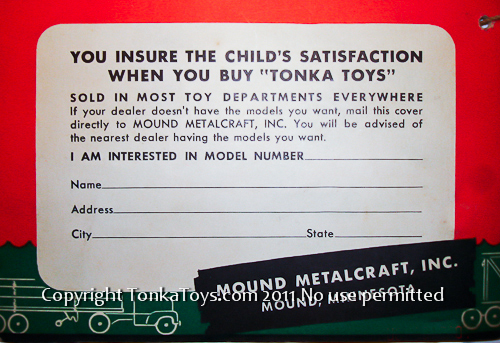 Back Cover of the 1953 Tonka Toys Look Book which was used as a mail in request for more information about specific models. 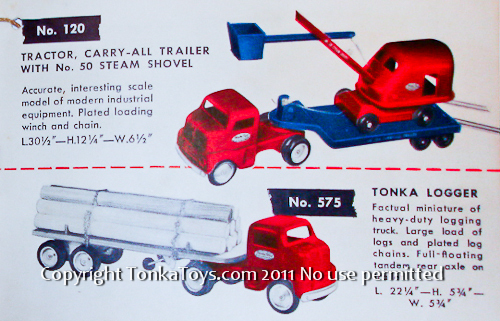 Wanted Tonka Trucks : I am currently looking for the following Tonka's in the configurations noted these private label Tonka's are harder to come by as they were not included in catalog sets, if you have toys like this please let me know I would love to have the opportunity to buy them from you and add them to my website.